One of the best ways companies show employees that they care about them and appreciate their hard work is by throwing an annual Christmas party. Corporate Christmas parties offer the chance to reward and engage with employees and motivate them for the year ahead, in the process boosting morale. For many business owners, planning a holiday party for all of your employees can be a challenge. You want them to enjoy themselves, so you need to determine the costs of food, drinks, entertainment, and transportation so that they can travel to and from the party safely. In regards to transportation, renting a charter bus for a corporate holiday party is one of the best ways to ensure your employees are comfortable and enjoying themselves, as well as arriving at the event on time. If you are interested in using corporate shuttle services for your business’s holiday party, consider the following tips. Your holiday party needs to have a budget, or spending can get out of hand, and fast. It’s vital to know what your budget is for corporate holiday parties, so you don’t have to spend more than you need to. In addition to food, drink, and entertainment, one of the biggest expenses is finding reliable transportation. Once you have set a budget, begin figuring out how to pay other costs such as venue reservations and other activities. Once you have figured out the date, location, and time of your holiday party, it is important to send employees an invitation a month or two prior so they can plan accordingly. Employee’s planning to attend should RSVP. This will give you an idea of how many people will be attending, which will allow you to better determine how much food and drinks will be needed as well as what type — and how many — charter vehicles you need. Create a detailed itinerary so you know how many drivers will be needed to pick up and transport your employees to the party. Make sure everyone has a copy of the itinerary to ensure that they know where they need to be and when! Don’t wait to reach out to venues, caterers, and entertainment. These services tend to book fast, especially during the holiday season. Once you have set your budget and know the details of the party, begin reaching out to the necessary vendors to ensure everything is set and ready for the date of the party. 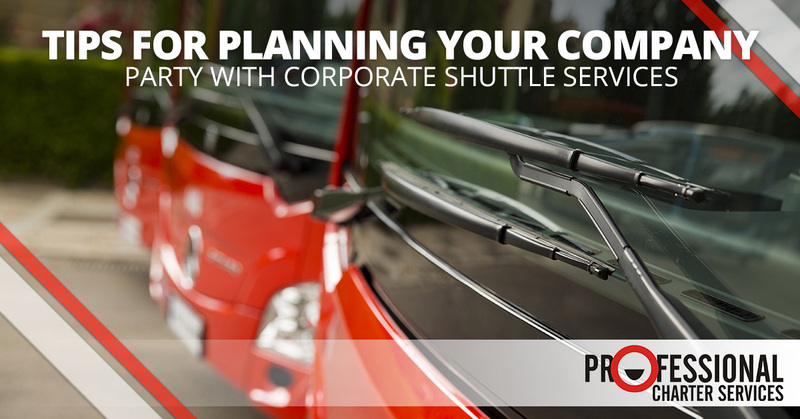 Don’t forget to book corporate shuttle services to get your staff to and from the event. A charter bus rental is like renting a private bus for the night and is a great choice for companies of any size Get some important information about your corporate event such as your budget, the type of business or organization involved, travel itinerary, and the size of the group that will need transportation to reserve a charter bus rental for your party. There is a lot to consider when it comes to planning your corporate holiday party. If you’re the one who’s planning every detail, then considering renting a charter bus to transport your employees there safely. To learn more about our corporate charter buses, contact us!